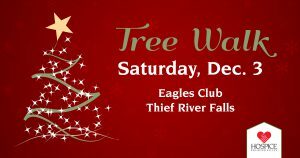 The 2nd Annual Eagles Tree Walk will be held Saturday, Dec. 3 at Eagles Club #2368, located at 305 Red Lake Boulevard in Thief River Falls. Join us for an event featuring beautifully decorated trees and a variety of activities. Vote for your favorite tree — the tree that receives the most votes will receive a special award. The decorated trees will be available for purchase through a silent auction. Paper angels can be purchased at the event to decorate the Hospice Memorial Tree. Enjoy activities, food and local entertainment throughout the day! See the schedule of events below. All events are free will donation, except for the tree auction and bake sale. Net proceeds benefit Hospice of the Red River Valley. 10 a.m.-7 p.m.: Tree Walk – View decorated trees and vote on your favorite. Trees will be available for purchase through a silent auction. Coffee, cider and cookies will be served during the Tree Walk. 10 a.m.: Holiday Bake Sale – Take home some tasty treats. The bake sale runs until the items are gone, so get there early!